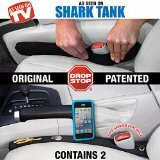 Shark Tank on Friday, July 6 is a re-run of episode 302 which originally aired on February 24, 2012. The Sharks appearing on this Shark Tank are Mark Cuban, Lori Greiner, Robert Herjavec, Daymond John and Kevin O’Leary. First up is Jared Joyce and his Five Minute Furniture. Jared made a big splash when this show originally aired. He had a live podcast going during the show and he really used social media well before, during, and after the show. He also had a few of the more memorable lines from season three, including my favorite: “Hey, you guys want to get married, all I'm saying is let me buy you a drink first.” While the sharks didn't fund his Five Minute Furniture, he has had success with this invention and he got a grant from Edison Nation. Expect to see Five Minute Furniture in stores next year. Next in line is Raven Thomas and her Painted Pretzel business. I spoke with Raven last week (read the interview here) and she made a very sweet deal with Mark Cuban. Raven had more orders for her Painted Pretzels than she could handle and needed cash to help fulfill those orders. All the Sharks liked her product (she told me not a crumb was left from the samples she handed out), but Cuban, in classic Shark Tank fashion, made her decide on the spot. Apparently the business relationship has gone well and Raven is selling a lot of pretzels. Someone sent me some and they were delicious! Esso Watches and entrepreneur Ryan Naylor took a beating from Mark Cuban in this segment. Cuban called the watches, purported to be infused with negative ions to restore energy, a scam and even threatened to beat the crap out of Kevin O'Leary if he invested. Rick Hopper made the most memorable entrance in season three, falling to the floor as he entered the Shark Tank to demonstrate his SpecSecure magnetic eyeglass holders. Lori Greiner was all over this product and invested with Rick. Lori knows when a product will be a hit and, once again, she was right. They sold out on QVC in less than 15 minutes when she promoted SpecSecure. The follow-up segment features Johnson Bailey and The Original Man Candle. The segment shows a successful, vibrant small business. Even though Bailey was not funded in season two, he made a go of his company with guidance from the sharks- particularly Daymond John. Since this follow-up segment aired, Both Johnson Bailey and Man Candles have disappeared. The website is gone, the Facebook page is gone, and inventory of Man Candles on Amazon is dwindling. The guy has dropped off the face of the earth!